Oscar Robertson began his adult basketball career at the University of Cincinnati. Beginning with his first season, 1957-58, Robertson made his mark as the best basketball player to wear the Bearcats uniform. This trophy was awarded to Robertson by ULEX, a University of Cincinnati activities group. The ULEX Award is unique in that it was voted on and awarded by the student body, and is a tremendous show of appreciation by peers, especially when you consider this was the late 1950’s and Robertson was African-American at a predominantly all-white school. 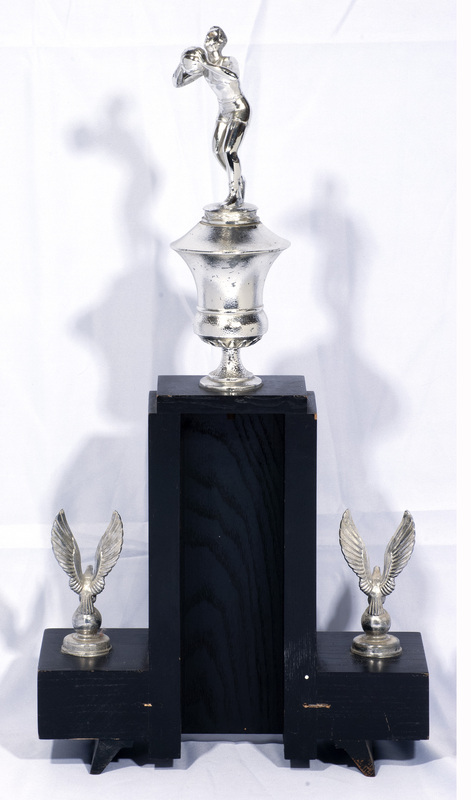 The 10.5” wide, 20” tall piece features a basketball player atop an urn mounted on a blackened wood base (10.5" wide). 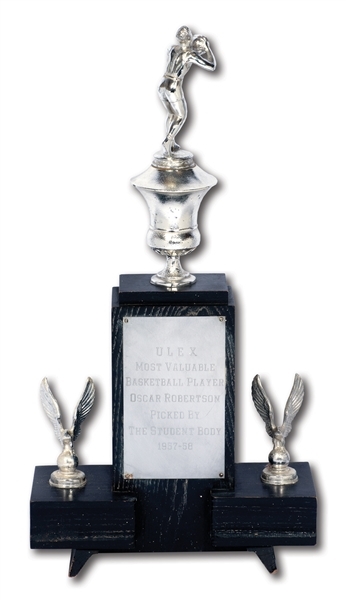 Two soaring eagles flank an engraved plaque that reads, “ULEX MOST VALUABLE BASKETBALL PLAYER OSCAR ROBERTSON PICKED BY THE STUDENT BODY 1957-58.” The award is in good overall condition with some wear on its edges and scuffing and abrasions from age. Includes LOA from Oscar Robertson. Oscar will donate a portion of his auction proceeds to the Jerome Lipper Multiple Myeloma Center and LeBow Institute for Myeloma Therapeutics at Dana Farber. This renowned cancer treatment center “provides comprehensive care to patients with multiple myeloma, including promising new therapies through clinical trials rooted in an approach that brings laboratory discoveries quickly to the clinical setting (https://www.dana-farber.org/multiple-myeloma-program).